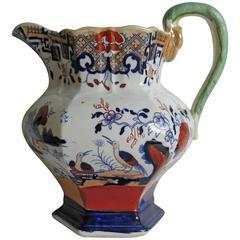 This is an early Mason's Ironstone Jug in a rare shape and pattern. 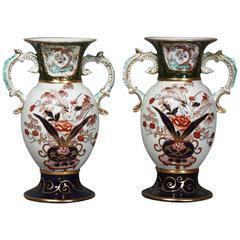 The jug has a globular body with a loop handle - normally Mason's jugs are in the octagonal hydra shape or sometimes the Fenton shape. This globular shape is much rarer. 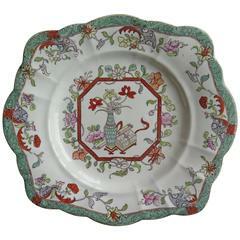 The pattern is one of Mason's oriental people designs, called The Red Scale - Conversation group and is shown on Page 77 of A Guide to Mason's Patent Ironstone patterns, circa 1813-1848, as published by The Mason's Collectors' Club. 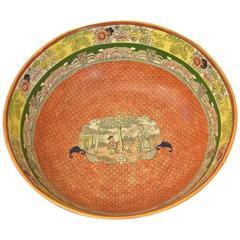 The design would have been transfer printed then hand painted in a free flowing style using bold coloured enamels. The base has the Wide spaced Mason's printed mark in black, indicating a date of circa 1820. Previous restoration to mid body crack. 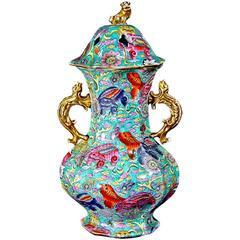 - but very rare Jug. No Chips. 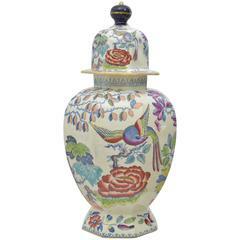 Mason's ironstone lidded jar or vase with bird and floral decoration.